Last night I held my Turtle & Co. mini stamp-a-stack. I had 6 great ladies attend and we had a lot of fun. They are now fast friends with Turtle, Frog & Snail! Here is one of the cards we made last night. I got the inspiration for this layout from an advertisement in a catalog I received. I loved the circles and the colors used were almost exactly the same as the new In Colors. I wish I had saved the page so I could show you but it was lost somewhere along the creative way (aka the messy messy stamp room)! A few of my stamping ladies last night had never done heat embossing so this was a great card for them to learn on. They made sure to use the embossing buddy on their cardstock to keep stray embossing powder from ruining their images. Then they stamped the images in Versamark, covered them in white embossing powder (looks awesome against the bright colors doesn't it??) and heated them with the heat gun. Then the 1 3/8" circle punch punched out each image. For the sentiment all we did was emboss like the rest of the images and then use the paper snips to cut out each word and glue them to the circle. The base of the card is Naturals White, then a layer of Island Indigo and then another layer of Naturals White. We used a strip of the new ruffled In Color Ribbon in Pool Party. I added one little pleat to my ribbon before adhering it. We popped each circle up with dimensionals and then as a final touch added a bitty button using a glue dot. We did 2 more projects at the mini stamp-a-stack so be sure to check back over the next few days to see them. Don't forget that for each Turtle & Co. stamp set sold Stampin' Up! donates $3 to the Ronald McDonald House Charities. Buy an adorable stamp set and help families with sick children...it's a no brainer right? Wow!! Have we had a busy and crazy week. A Stingray attack, an earthquake and a hurricane evacuation! Can't get much crazier than that huh? This past week we were down in Corolla, NC which is in the beautiful Outer Banks. We've been going there for vacation for about 8 years now and the last few we've brought our parents with us for a big family vacation. So on Tuesday morning we're all having fun playing in the ocean and the sand. I look up from the hole I'm digging and see my husband limping out of the water. I thought oh geez, he busted his knee again. He could barely walk and his mom was helping him stand. When I got to him he said something stabbed him in the foot and he had a puncture wound right below his ankle on his foot. We got him back to the house and he was having a lot of pain so we called 911 to see if we should bring him to the medical facility (about 40 minutes away) or have the ambulance come. The EMTs arrived and said that it was definitely a stingray that "stung" him. Luckily it wasn't a large stingray as those can apparently put their barb clean through which would have been even more painful. We had to keep very hot water running over his foot for a while and the EMT made sure the barb wasn't stuck in the wound. Then he spent most of the day with his foot in the hot tub. The heat helps break down the toxins that are injected when the ray releases its barb. He was able to hobble around later that afternoon and the next day he was feeling much better and said that it just felt like he had twisted his ankle. The EMTs told us that in the past few weeks there had been a lot of incidents just like what happened to my husband. We'd never heard anything like that happening in the Outer Banks and were told that for some reason it just started happening. Weird! So we were all kind of paranoid getting back in the water but tried to carry on an enjoy the beach. Later that same day we felt the earthquake too! Well, I didn't feel it since I was in the water but my mom was reading on the beach and felt it...we kind of thought she was crazy when she told us she thought we just had an earthquake. My husband was in the hot tub for his foot and jumped out because he thought the deck was falling down. My in laws were inside the house playing cards and said the whole table was shaking back and forth. The earthquakes epicenter was only 30 miles from our house here in Richmond so we were hoping we didn't have any damage when we got home. The house seems fine thank God! Then on Thursday morning at 11 we were given the evacuation notice to leave the Outer Banks due to the approaching hurricane. We'd been watching the storm and kept hoping it would blow far east so that we could stay and finish our week at the beach but no such luck. They started coming around the neighborhoods with the bullhorns to let people know they needed to leave. I guess going for 8 years we were bound to run into a hurricane sooner or later though usually September is has the highest risk for hurricanes! We all got to work and packed up the entire house and loaded the cars and were on the road by 12:45 and that included a quick lunch. We wanted to get on the road quickly in case the traffic was really bad from everyone else leaving too. We didn't have hardly any traffic on the way home and arrived in Richmond about 5pm. It was hard leaving the beach since it was beautiful and sunny and we wanted our 2 more days of vacation. But we're all safe here in Richmond watching the rain now so I figured I'd get on the computer and post another card that I made before our vacation. I sent this one to my super sweet blogging friend Patti. Check out her blog Cherish Each Precious Day, she is a great color-er (is that a word??) and I envy her skills. Patti always leaves such sweet comments for my cards and I wanted to let her know how much I appreciated her taking the time to do that. I feel like I spend most of my stamping time preparing for classes and I don't get to make many "just because" cards so it was important to me to get this one made and mailed out to Patti. I used Inspiration Challenge 197 over on Splitcoaststampers. My inspiration was this cute little button worm on THIS page. I thought a caterpillar would be cuter than a worm so that's what I'm calling mine. I even added antennae to change him from a worm to a caterpillar. I kept basically the same colors as the inspiration piece. I cut out various colors and shaped buttons from my Sweet Button embosslit die. I used some Early Espresso baker's twine for the antennae and just tied little knots on the ends and adhered to the back of the head button. Next I arranged and adhered the buttons on the card to form the caterpillar body. Once I was happy with that part I covered each button very carefully with a nice healthy layer of Crystal Effects. Once that all dried my button were nice and shiny like real buttons but without the bulk. Hopefully you can see this cool effect in this close up photo. While I was waiting for my buttons to dry I made the little hello banner out of a scrap of Naturals white cardstock. I colored the words with my markers to get the multiple colors to match my caterpillar. Next I added Early Espresso brads to each of the corners. To finish this one off I gave my little bug some googlie eyes. Remember if you like the Happy Greetings stamp set used on this card or any of the other ones from the Summer Mini catalog don't wait to order. Summer Mini items are only available for a few more days. Click on my Stampin' up! website on my sidebar to order now. Also, the Buy 3 Get 1 FREE on the Designer Series Paper is ending the last day of August. At the end of the month I'm having a mini Stamp-a-Stack using the Turtle & Co. set so I've been busy playing and making samples and trying to decide which cards will be made at the event. This one I think is cute but didn't make the cut. I kept playing around with the colors and I just couldn't get one that I was completely happy with. Hopefully it will give someone out there some good ideas though. Check back after August 30 to see which cards we made at the mini Stamp-a-Stack. This is the same layout as a sample in Idea Book & Catalog. The base is Peach Parfait with another panel of Peach Parfait embossed with the Perfect Polka Dots embossing folder. I stamped the frog on Whisper White in Stazon and then used a blender pen and Watercolor Wonder Crayons to color it in. I stamped the thought bubble on scrap paper, cut it out and popped it up on a dimensional. I used the new pennant punch to make a little flag for the froggie to hold. To add a little bling I put a Concord Crush Glimmer brad on it and adhered it with dimensionals. The flag "pole" is a toothpick that I cut down to the right size and glued down with a little bit of mono multi glue. The ribbon around the card is the Concord Crush poly twill. I wrapped it around the card then taped the ends down underneath the tag. I tied a knot in a second piece of ribbon and adhered that to the tag with a glue dot so I didn't have to try to thread it through the tag. Looks like all one piece but it's not! A little stampers secret...also a nice way to save some ribbon. You don't need as much as if you were trying to tie all one piece. Here is the next installment of my Christmas cards for 2011; the July edition. This is a cool folding technique called tea bag folding that I stumbled upon while poking around on Splitcoaststampers. It is super easy and I learned how to do it in about 2 minutes by watching this video and in no time at all I had an adorable folded Christmas tree. This is a great way to use up some smaller pieces of DSP in a really unique way. I'm trying to be good and use up some retired DSP since Stampin' Up! is having the awesome buy 3 get one free sale and I only have so much space in the stamp room. What's a stamper to do? I mounted it on a panel of textured Very Vanilla and the tree trunk is also Chocolate Chip textured cardstock. I added a little bit of Very Vanilla seam binding because I have to have some ribbon my cards otherwise they just seem naked...especially Christmas cards. The sentiment is from the great new set Petite Pairs and I punched it out and adhered it with dimensionals. The final touch is the rhinestone on top of the tree....it looks kind of like a star right? So how far along are you on your Christmas cards? Now is a good time to get started! Check out the Holiday Mini catalog on September 1 to get some great ideas for your holiday projects! I made this card for my friend's daughter's 6th birthday. My friend is also my neighbor and one of my stamping ladies so of course I have to make sure any card I give her daughter is I used the same color scheme that was on the party invitation, bright pink and bright green. My specific colors are Melon Mambo and Wild Wasabi. I totally love these little balloons from Up, Up and Away so I wanted to use this set again. The background DSP is the retired Sale-A-Bration paper Welcome Neighbor from a few years back. I stamped the balloons on Whisper White and then cut them out and popped each one up on a dimensional. I ran a strip of the retired Melon Mambo pom pom fringe across the bottom and added the sentiment. I jazzed up the balloons and the sentiment with the little flower from the itty bitty punch pack and added some little adhesive rhinestones. Also, for my local ladies, you should be getting your copy of the Holiday Mini in the mail if you haven't already. I got the one I mailed myself this past week so they are being delivered. It goes live on Sept. 1!!! If you're new to the Richmond, VA area and are looking for a demo or are interested in getting a copy of the Holiday Mini give me a shout and I'll get one out to you! I've had a lot of time in the stamp room lately and using various challenges to get me started on my projects has really maximized that time. I have a focus on colors or layout and don't spend a lot of time messing around with various choices (and we all know how many choices are sitting there in our stamping areas just calling out to us!). This card is one that I combined the Clean & Simple challenge on Splitcoaststampers with the color challenge from the Inkspirations Challenges website. The CAS challenge was to use partial images so I thought these cute dinosaurs from the new set Dinoroar would fit the bill just stamped along the edges of the cardstock. I ordered this set as soon as it was available since I began to realize with all the boy birthdays we had earlier in the summer that I was very ill-equipped as far as boy stamps went. This is a fun little set to color so you can do endless combinations. Next, I colored one section of the School Lines stamp with my Crumb Cake marker and then stamped it. Then I colored just part of the sentiment stamp from Dinoroar with my Basic Black marker and used my Stamp-a-ma-jig to line it up just right. I added a Crumb Cake button with some hemp twine tied through the holes. I was thinking that I might give this to my son on his first day of kindergarten in 2 weeks. Ack!!! How did he get to be in kindergarten??? I'm not old enough to have school aged children am I? Ha! I made this card a while ago as a thank you to our neighbors who took care of our dog when we were away. Our dog, Josie, is a wonderful Frisbee catcher and all around great fetcher so I though thought that stamping a dog catching a Frisbee would be cute. It came together quickly, except for the Frisbee! I could not cut out a shape that looked like a Frisbee to save my life! The Frisbee on the card was my final attempt and I decided that was as good as it was going to get. Josie is probably glad her real Frisbee is more aerodynamic without the jagged edges! The base is Crumb Cake with some Crumb Cake paw prints at the bottom. The dog, let's call her Josie, is stamped in Basic Black on Whisper White. To get the look of Josie running all you need to do is keep stamping without reinking your stamp. As you stamp it along your cardstock away from the first image the ink becomes more faint giving the impression of running. I've seen some really cute cards that use this technique for running horses. This is a really easy way to add interest to an animal card or a card with cars or other vehicles. Since I was hand-delivering this card to our neighbors and didn't need to worry about the USPS I added a little mini library clip holding the sentiment. The thanks was stamped on top of the bone and then punched out with the oval punch. I tied a bakers twine bow around the clip just for fun! I am having so much fun with the new set Field Flowers. Flower stamps work for just about any occasion except maybe a guy card unless the guy is totally into gardening or something. But really, for anything else a flower works! Just change around the greeting and colors and you get a totally new look. I made this card to send to one of my stamping ladies who went out of her way to drop to off an embossing folder that some how made its way into her order bag instead of someone else's. I blame my boys for messing around in my stamp room when they shouldn't have been! That's my story and I'm sticking to it! =) I used both the Splitcoaststampers Color Challenge and Sketch Challenge from last week for this card. Challenges are a great place to look when you need a little push in getting started on a card. Sometimes I sit down and know exactly what I want to make and other times I need some help getting the creative juices flowing. Even if what I end up with isn't anything like the layout or colors from the challenge it gave me a starting place to focus on. Check out some challenges to get a card started or just to jump out of your comfort zone! The flower stem was stamped with Lucky Limeade on Whisper White. I stamped the flowers next using Poppy Parade and Daffodil Delight. I stamped them twice more on scrap cardstock and then cut them out with my paper snips (probably my best spent $9.95 ever!). I popped the cut out ones up on dimensionals and then layered the image panel on Daffodil Delight. I used a scrap strip of Poppy Parade twill ribbon to go across the stems and added the sentiment from Petite Pairs on the right side. And of course the sentiment circle is popped up with a dimensional. 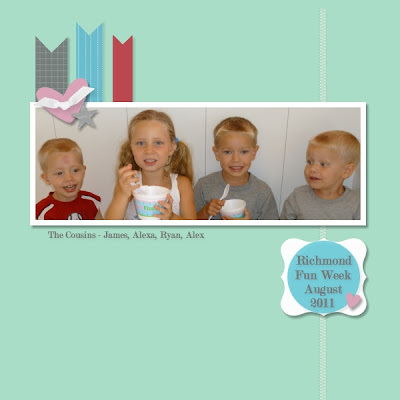 Petite Pairs has perfect sentiments to use with punches and has a nice variety of fonts. I know this will be one of my "go to" sentiment sets for a long time to come. The base of the card is Crumb Cake with a piece of Lucky Limeade In Color DSP on the bottom half. For my local stamping ladies; please remember if you'd like to join me on August 30 for the Turtle & Co. Mini Stamp-A-Stack I need your payment by this Thursday Aug. 18. Please see my Stampin' Up! Events Calendar HERE for more details. I made this card earlier in the week to send to my downline, Jen. She just joined Stampin' Up! as a demonstrator and I wanted to thank her for choosing me as her upline. She's a sweetheart and I'm super excited to have a local demonstrator buddy to stamp with. 2 weeks ago during church I noticed someone's dress which had a really cool color combination. Early Espresso, Very Vanilla and Calypso Coral. I know you notice things in Stampin' Up! color combinations too! Don't lie....we all do it! In advertisements, at Target, on people's clothing.... Anyway, I made sure to write it down (on Ryan's children's bulletin!) so I wouldn't forget because at my house if it isn't written down it doesn't get done! Anyway, on Monday I checked out what the challenge was for the day on Splitcoaststampers. I haven't done a Splitcoast challenge in ages and it was a CAS challenge which are Clean and Simple cards. Perfect! It was a sketch challenge so I took my church color combination and used the layout to make this card. I inked up the largest stamp in the Just Believe set using Very Vanilla craft ink and stamped it on the Early Espresso panel. Obviously I need to get a reinker for this pad since it didn't get quite as opaque as I would have liked but I think the end results still looks pretty good. I used my Beautiful Wings embosslit to cut out some little Calypso Coral butterflies. I hit them with a good spray of Smooch Spritz and after they were dry added an adhesive pearl to the center of each one. I popped the top butterfly up with an itty bitty piece of trimmed dimensional. The Beautiful Wings embosslit is great because you get different sized butterflies so you are sure to have a size that fits your project. Also, it takes hardly any paper at all so it's a great way to use up scraps! And that is never a bad thing! You don't want to be that papercrafter who got buried in her craft room under a ton of scrap paper! I made a Fork Bow out of Very Vanilla 5/8" satin ribbon to wrap around the top image panel. Then I stamped the "thank you" from Just Believe in Early Espresso ink on Very Vanilla cardstock. I punched out the sentiment with the Decorative Label punch and then sprayed it with Smooch Spritz so it would be sparkly like the butterflies. Then I layered it behind the bow. The image panel is mounted on a slightly larger piece of Very Vanilla and then the base is Early Espresso. Go check out this week's CAS challenge and see if you can make a card using this layout. It's so versatile that you're sure to make a fabulous card! How cute are these little boxes?? I made these little darlings for my July hostesses using the fun new In Colors and filled them with some embellishments to use on the creations they make at home. I saw THIS tutorial by Dawn Olchefske earlier in the year and made a note of it on my "projects to try" list. I finally got around to trying it and it is way easier than I thought it would be. Seriously, a few score lines and a few cuts and you're done! Check out Dawn's fabulous video and see how you can turn the Petal Cone die into a little gift box. I used Calypso Coral, Wisteria Wonder and a hint of Lucky Limeade for these boxes. Such fun new colors! Once I had my Petal Cone pieces cut and scored in the right places I stamped them both with the little flower piece from the Pennant Parade set and put them together. I used sticky strip to make sure they held together for the long run. Then I tied some 1/8" taffeta ribbon around to hold them closed. I used the scallop circle punch to punch out eight or 9 pieces of the In Color DSP and then crumpled them up before layering them and adding a piece from the Blossom Bouquet triple layer punch. All the layers are held together using a Designer Printed Brad. I added a little banner with their names to finish it off. I so appreciate my hostesses and this is just a little way to say thanks for being excited about Stampin' up! and joining my hostess club this year. I am still a little behind in making my cards for the Christmas Card Challenge over on Splitcoaststampers but I'm still way ahead of where I usually am at this point in the year (which is usually a big fat zero!). I was able to catch up through my June cards with this design. I still need to do July and August and I'm planning on designing those soon. It's hard to get in the Christmas mood when the weather is 95+ degrees and the humidity is close to that too! This card is super sparkly and shimmery. I used my Shimmer Paints to make Shimmer Mist and once I had the card all put together I gave it a good blast of the mist and it just sparkles away! And the cool glass glitter definitely gives off it's own sparkle too. I hope you can see it at least a little bit in the photos. To make the Shimmer Mist just fill up a little spray bottle (I got mine in the travel/sample sized area near the pharmacy at Target) with some rubbing alcohol then add a few or more drops of your chosen Shimmer Paint and shake really well before spraying. Now you have a great mist of shimmer! Don't worry about your cardstock being wet, the alcohol dries/evaporates very quickly leaving just your sparkle behind. The base is Basic Gray and the next layer is Very Vanilla. I stamped the Serene Snowflakes set with Very Vanilla craft ink onto the Basic Gray layer. I love the Whisper White and Very Vanilla craft inks for stamping onto darker colored cardstock. It is a really cool contrast. I used the half scallop circle from the Big Shot Petal Cone die to cut out a Very Vanilla piece and then stamped the Christmas greeting from the new Delightful Dozen set in Basic Gray ink. This set has a great variety of larger sized greetings for a lot of holidays and occasions. I added some adhesive pearls to balance the left side of the half scallop circle. And do I need to say that the greeting is popped up on dimensionals? To get the perfect line of Glass Glitter going across the card I just used a piece of red sticky strip tape across the card and pressed the Glass Glitter into it. The Glitter stays put on the tape and you just dump any excess back into the container to use another time. The Glass Glitter is so elegant and I can't wait to design some more projects using it. I finished off the embellishments with some Very Vanilla 3/8" taffeta ribbon. This ribbon is retired so I was just trying to use up my stash since I can't use it for classes anymore but the Very Vanilla seam binding ribbon would be a great substitute instead. For any Richmond, VA area stampers that are interested in joining me for an upcoming class please check out my calendar of events link HERE. On August 30th I will be having a mini Stamp-A-Stack. 2 cards each of 3 designs using the new Turtle & Co. stamp set. This is the exclusive limited time Ronald McDonald House Charities stamp set that Stampin' Up! designs and then donates $3 for each set sold to help RMHC. Come create some great cards all while helping a very worthwhile cause. Cost is $24 for the clear mount option (blocks not included) or $29 for the wood mount. Class fee includes stamp set, tax, shipping, and all project supplies except your favorite adhesive. I need to have your payment by August 18 if you would like to join this fun event. Contact me if you have any questions! I have actually been making it into the stamp room lately and I feel so much better to have had some relaxing time to myself. All 3 projects are designed for my class later this month, I've made several thank you cards that needed to be sent, a baby card and some other cards just for fun. I'll be posting some of these over the next week or so but for today we have the last of the 3 projects my stamping ladies made at July's class. As soon as I saw the Up, Up & Away set in the new catalog I knew it was going to be on my wish list. And it didn't stay on the wish list for very long. I made sure to include it on my very first order when the new Idea Book & Catalog went live on July 1. It has such cute little hot air balloon images, the sentiments are in a fun font and the little accent stamps are too adorable....how could you not smile at the little clouds, birds and the little basket? This is a cool fun fold card. It's called a Vertical Crisscross card and it makes a cool little pocket to slip your sentiment or note into. I used the tutorial HERE on Splitcoaststampers. Scroll down to the bottom of the tutorial for the dimensions of the vertical style. This is a fun card to do to show off some DSP. For this card the base is the new In Color Island Indigo and we used the matching DSP. The base of the insert is also new, Pool Party which I think I'm in love with (along with about a million other stampers!). The third color is new too, Calypso Coral. Do you see the summer, beachy, tropical theme here...makes me want to go on vacation right now! To make the balloon images we colored the stripes with markers then cut out the balloon. Don't worry about the cutting ladies! It's a super simple shape to cut out and it takes no time at all. Don't that that deter you from using this set. The clouds are stamped in Pool Party ink, and the basket in Island Indigo. The balloon is mounted using a dimensional and and makes a nice little handle to pull the insert out. The finishing touches are the rounded corners on the insert, the sentiment tag that was punched out using both tag punches, and my 2 favorite things...The new 3/8" Pool Party ruffled ribbon and the Calypso Coral Designer Printed Brads! It's always fun to have new accessories to go with the new colors. Don't forget about the Designer Series Paper special that is going on the whole month of August. Buy 3 Designer Series Paper packs and get 1 FREE! What a great deal! Go to my online store to order. The link is in my sidebar. In my post yesterday I mentioned that my cousin and her kids visited this week. We were very busy doing all sorts of fun things around Richmond. One of our stops was down in Carytown at the Sweet Frog yogurt place. Apparently these places are very popular but I hadn't heard of them before this summer....I must live under a rock or something! Anyway we took the kids down there and they enjoyed choosing their own flavor and adding yummy toppings. Definitely a big hit with the small fry! I hope everyone has a great weekend! Thanks for looking. Did you stamp today? Wow! We had a super busy week doing fun stuff with my cousin and her kids. We went for a walk in the woods, went to Maymont, painted our own pottery, tested out a frozen yogurt place (good! ), went to the new Winnie-the-Pooh movie, went to a bouncy house place, swam at the pool, made our own super bouncy balls, made Christmas ornaments, drew a chalk city in the street to ride bikes on and now it's time to rest! Whew! Hopefully I'll get some time in the stamp room this weekend, I think I'm having withdrawl! Here is another card that we made last week at my July Stamp Club. It's another masculine card made with the single stamp Sail Away from the summer mini (Only a few weeks left to order from this catalog. Don't wait!!). We used the Clear Block Stamping technique for this card. This is one of the easiest techniques you will ever use! Just take your clear stamping block and ink it up. Yes, just tap, press, or smoosh your clear block onto your ink pad and then press it to your card stock. It leaves a really cool impression that's a perfect background to stamp right on top of. For the clear block stamping here I used Crumb Cake ink and stamped the Sail Away image on top using Not Quite Navy ink. Cool! For this card I also wanted to show off some new items from the Idea Book & Catalog. It might be hard to see but the Early Espresso panel is embossed with the new Houndstooth embossing folder. This new pattern is very cool and I can't wait to use it on some winter cards. Houndstooth just makes me think of colder weather! Another new item that I used on this card was the new Pennant Punch. I punched out the straight edged pennant using the Nautical Expedition DSP and mounted them on a strip of Crumb Cake cardstock alternating which way they faced. I added a silver brad on each end and some bakers twine for more nautical flair. There are some fun promotions going on right now at Stampin' Up! Don't miss out on a great deal! The first is, is a Buy 3 get 1 FREE of Designer Series Paper. This special does not include the specialty DSPs but does include the papers in the Summer Mini. Now is a great time to get your DSP for holiday projects and gifts! Order online through my demonstrator website listed on my sidebar. The second is; the state of Virginia is having a sales tax holiday for school supplies up to $20.00 per item from August 5-7. Because school supply items are included in this sales tax holiday, the below list of items will be state tax free during the holiday period. Please note that you must place your order with Stampin' Up! during the tax holiday period in order to receive these items tax free. Now is a great time to stock up on adhesives! You can place your orders through my Stampin' Up! website listed on my sidebar. Have a great weekend! Thanks for looking. Did you stamp today? I hope everyone out there in stamping land had a great weekend. We spent most of the day on Saturday at the pool and then went home and lazed around until dinner time. It was a great relaxing day. On Sunday we didn't do too much after church as the weather was kind of iffy but we got some stuff done around the house and that always feels good to check things off "The List". I even did some stamping to get samples ready for my class at the end of the month. Don't worry I'll show those after the class! My cousin and her 2 kids arrived today from Connecticut to spend the week. Our kids are the same ages so it's fun to see them all playing together. We have a busy week full of fun things to do around Richmond so I probably won't have much of a chance to post but I'll do my best. This card is one of the projects we did last week at stamp club. I got so many new things when this new catalog came out I had a really hard time designing the projects as there were just too many choices! I tried to stay simple for this card. The Field Flowers set is so pretty with so much detail on the images. I can't wait to sit down and create some more with it. If you haven't done 2 Step Stamping before this is a great set to get, especially in clear mount. You can line everything up so easily it's not even funny! This photo doesn't do this card justice. I need to check my camera and see if the settings are off or something! I stamped the stem first using Pear Pizzazz. We stamped right onto the First Edition Specialty paper. The style of this paper stack is perfect for a bit of vintage-y flair. The flowers were stamped next in Peach Parfait. Always stamp the stem first! It's way easier to line the flowers up on the stem than the other way around. Next, I 2 Step Stamped by adding the centers of the flowers using the Dynamic Duo to Peach Parfait, which is Cajun Craze. The Color Coach is great for finding tone on tone color combinations to work with 2 step stamp sets. I used the 1 1/4" circle punch to punch a half circle on the right side of the top 2 panels. Finally, I tied a piece of new (!!) Chocolate Chip 1/2" Scallop Dots ribbon around to finish off the card. Today demonstrators were able to begin pre-ordering from the Holiday Mini catalog which goes live to customers on September 1. I haven't even inked up all of my new sets from the big catalog yet!! I guess I better start thinking about the holidays huh? It's never too early to get some ideas down on paper so you're ready when you can order from the Holiday mini!